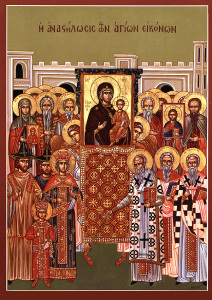 An icon celebrating the veneration of icons, the Triumph of Orthodoxy is the festal icon for the first Sunday of Great Lent. As Lent is a period of communal fasting which continues for seven weeks, such triumphalism early on is understandable: it helps to strengthen the faithful for the coming days. It is also understandable given the century of struggle which preceded the events in the Icon; years in which it seemed as though the Faith of the Church was overcome.